How Do I Know Which Type of Contact Lens Is Right For Me? Where Do I Go to Get Contacts Lenses? Contact lenses have come a long way lately, and offer some exciting options for the consumer. You can bat a pair of baby blues one day, then flash golden tiger eyes the next. You can toss your disposable lenses in the trash each night. Or you can leave in your extended wear lenses for an entire month. 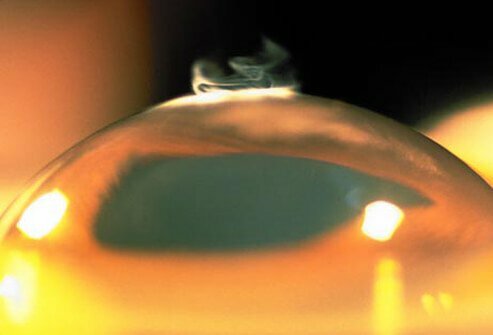 For people with vision problems, contact lenses remain an effective, almost invisible tool. The thin plastic or glass lenses are fitted over the cornea of the eye to correct vision problems such as nearsightedness, farsightedness or astigmatism. These days you can wear contact lenses even if you have presbyopia and need bifocals. You have so many options, how do you choose? Check out your choices of contact lenses here. Then talk with your eye doctor about the contact lens that may work best for you. Visibility tint. These colored contact lenses are lightly tinted so you can find your lens if you drop it. Visibility tints don't affect the color of your eyes. Enhancement tint. These colored contact lenses have a translucent tint that's meant to enhance your natural eye color. Enhancement tints are slightly darker than a visibility tint. Bifocal contact lenses are designed to give good vision to people who have a presbyopia . These contact lenses work much like bifocal eyeglasses, having two powers on one lens one to correct distant vision and another to correct near vision. Bifocal contact lenses come as both soft and rigid gas permeable lenses. The type of vision correction needed, your lifestyle, and expense will all play a role in your eye care specialist's recommendations for the type of contact lenses that you should wear. Contact lenses can be purchased from a variety of places including your eye doctor, a store specializing in optical wear, through mail order, or over the Internet. There is no one best place to buy contact lenses from. Before you begin to shop around for contact lenses, make sure you ask your eye doctor for your contact lens prescription. Without your prescription, you must buy your contact lenses directly from your eye doctor. Convenience. Is customer service readily available to assist you if need be? Does the company have policies with regard to contact lenses damaged during shipping? Insurance coverage. Be sure to contact your insurance company about their policy on contact lenses. This should be done before being fitted for contact lenses. Many plans offer discounts on contact lenses as long as they are purchased from specific retailers. Many plans also do not cover disposable or specialty contact lenses such as colored or bifocal contact lenses. Availability. Are your contact lenses in stock? Are you willing to wait longer if necessary for your contact lenses to arrive? Regardless of where you get your contact lenses, it is important to regularly get eye exams so that any changes in your prescription can be noted and the overall health of your eye maintained. Edited by Charlotte E. Grayson, MD, WebMD, November 2004. Blepharitis is inflammation of the eyelids. Acne rosacea, Staphylococcal bacteria, allergies, sensitivities to makeup or contact lens solutions, head lice, or other conditions may cause blepharitis. Symptoms and signs include itchy eyelids, burning sensation in the eyes, crusting of the eyelids, light sensitivity, red, swollen eyelids, loss of eyelashes, and dandruff of the lashes and eyebrows. Proper eyelid hygiene and a regular cleaning routine controls blepharitis. Blepharitis is an inflammation of the eyelids and occurs in two forms, anterior (outside of the eyelid) and posterior (inner eyelid). See a picture of Blepharitis and learn more about the health topic. A corneal ulcer is an open sore on the cornea. Infection is a common cause of corneal ulcer. Symptoms and signs of corneal ulcer include redness, eye pain and discharge, blurred vision, photophobia, and a gray or white spot on the cornea. Treatment depends upon the cause of the corneal ulcer. Eye allergy (or allergic eye disease) are typically associated with hay fever and atopic dermatitis. Medications and cosmetics may cause eye allergies. Allergic eye conditions include allergic conjunctivitis, conjunctivitis with atopic dermatitis, vernal keratoconjunctivitis, and giant papillary conjunctivitis. Dry eye, tear-duct obstruction, and conjunctivitis due to infection are frequently confused with eye allergies. Eye allergies may be treated with topical antihistamines, decongestants, topical mast-cell stabilizers, topical anti-inflammatory drugs, systemic medications, and allergy shots.